Compound Layout Report. Allows absolute positioning of reports and graphs. This is the default. Note: The technology used during design time and run time is different. This may result in the run-time document not looking exactly the same as it does during design time. Coordinated Compound Layout. Is coordinated so that all reports and graphs that contain a common sort field are burst into separate page layouts. Each value for the first sort field displays on a separate page. A compound layout report is comprised of individual component reports or graphs, either embedded or external. Reports and graphs can be positioned anywhere on the page. When you create a report or open Document Composer, the Properties window shows the compound document properties for the compound layout report. You can create pre-process code that applies to all objects added to a document. For example, if a report or graph within your document requires the joining of two tables, you can create pre-process code that joins those two tables. This join can then be used by any object in the document and any items following the pre-process code. In addition, you can create post-process code that runs after the document is run. This can be used in conjunction with pre-process code. For example, using pre-process code, you could create a join. You could then use the post-process code to clear that join. Note: Pre-process code and post-process code are not meant to display output. From the Insert menu, click Pre-process code. The procedure viewer window opens. Here, you can create the pre-process code that the document will use. A join is being used in this example. Click the component connector and select Join. Join the videotrk and movies Master Files. Save and close the Join. In your document, create a report frame. Double-click the report frame to open the procedure viewer. Normally, double-clicking a report frame prompts you to select a Master File for creating a report. However, when pre-process code or post-process code is present, the procedure viewer opens instead. Do not move, remove, or modify. Pre-process code above. This comment separates pre-process code from component code. Adding component blocks before this comment, or editing what is already there, modifies the pre-process code. Adding blocks after this comment affects the component code. Click the component connector after the pre-process code and select Report. The pre-process code joined the videotrk and movies Master Files, allowing you to use data from both in your report. From the Insert menu, click Post-process code. Here, you can create the post-process code that the document will use. A join clear is being used in this example. Note: Any pre-process code you created is shown in the procedure viewer. Do not modify or delete the pre-process code when creating or modifying post-process code. Click the component connector after all other procedure components and select Join. After the document runs, the post-process code will clear all joins. When combined with pre-processing code, you can create the joins before the document is run and clear the joins after. Your cursor becomes a crosshair. Click and drag the crosshair to create a report frame. Adjust the report frame to the size you want. You can use Document Composer to add embedded reports by either creating a report or importing an existing procedure. To create an embedded report, double-click the report frame. To import an embedded report, right-click the report frame and select Import existing report. External reports are reports that are created and saved outside of Document Composer. To reference (or add) an external report, right-click the report frame and select Reference existing procedure. An EX command will be used to execute the component procedure at run time. Bring to front. Moves an object to the front so that it is stacked on top of every other object it overlaps with. Send to back. Moves an object to the back so that it is stacked below every other object it overlaps with. Move forward. Moves an object forward one position in the stacking z-order. Move backward. Moves an object backwards one position in the stacking z-order. When using any of these commands, the stacking order of the object will change. This is reflected in the z-index property in the Properties window, The z-index is the stacking order of a specific object. Reports must be saved with PDF output format specified in the procedure. Only the first report in the procedure must be in PDF format; the other report formats are ignored. Graphs must be saved with a HOLD command, and specified as a format of SVG, GIF, or JPG. SVG will be the most common format since it produces the highest quality graphs. When creating new graphs from within the Graph tool, SVG and HOLD should automatically be selected. When active report is the output format, no graph outputs are supported. When PDF is the output format, SVG, GIF, and JPEG are supported. 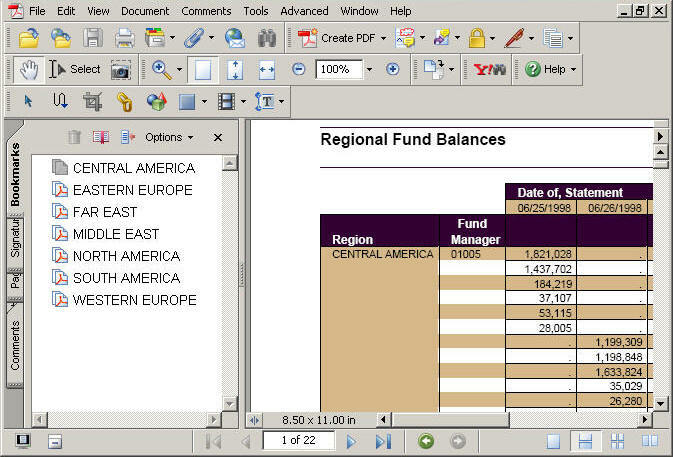 When Excel or Excel 2007 is the output format, GIF and JPEG are supported. When PowerPoint is the output format, SVG, GIF, and JPEG are supported. Note: When processing a coordinated compound document with missing values, any component that does not have data corresponding to the sort value will be presented as a blank (empty) component. Note: Coordinate report is set to Off by default. The output is burst into separate page layouts by the common sort field. In the example image below, the coordinated compound layout runs in PDF output with REGION as the common sort field among the report and graph within the document.